A Look Behind the Derleth Mythos: Origins of the Cthulhu Mythos by John D. Haefele is now available to purchase in hardcover. The likely audience for this book will include the wide breadth of readers interested in H. P. Lovecraft and/or August Derleth as well as the “imaginary world” crowd, especially those into the Cthulhu Mythos and including role-players. As such, it will also be of interest (an important associational item) to all Arkham House and related imprint aficionados and/or collectors. 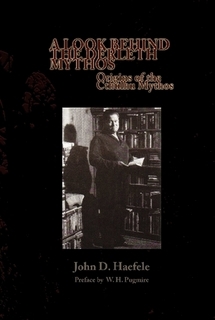 For more information and to purchase the book, visit www.lulu.com/shop/john-d-haefele/a-look-behind-the-derleth-mythos-origins-of-the-cthulhu-mythos/hardcover/product-20604420.html. This entry was posted on Thursday, January 3rd, 2013 at 12:30 pm	and posted in News. You can follow any responses to this entry through the RSS 2.0 feed.